Dallas-Fort Worth Airport, during construction in 1973. DFW before it was DFW. When DFW opened in January, 1974 — on 700 acres of land purchased from Irving rancher R. D. Harrington — it was served by only 8 airlines, had 3 runways and 56 gates. American Airlines Flight 341 from New York/Memphis/Little Rock was the first commercial flight to land at the airport, on Jan. 13, 1974. There was apparently an onboard battle to claim bragging rights to being the first passengers off the very first flight: a Fort Worth couple beat out a Dallas businessman for the honors — the Dallas man asserted, “I was the third person off the plane as the result of a shoulder block from the young lady who was the first person off” (Dallas Morning News, “First Flight A Scramble For History by Charlie Bates, Jan. 14, 1974). 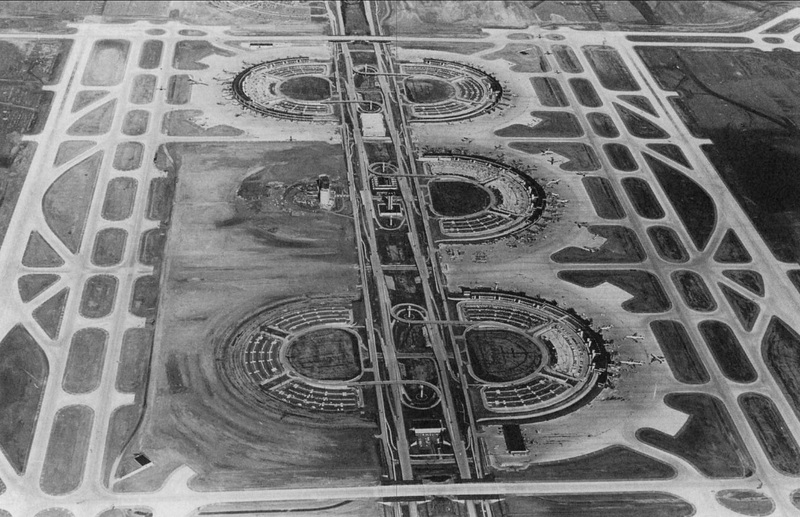 Top photo titled “Airview of terminal buildings and highway through the airport at Dallas-Fort Worth Airport during construction, ca. 1973; from UTA Libraries, Special Collections — more info here. Second photo is from the Texas State Historical Association 103rd Annual program (March, 1999), found on UNT’s Portal to Texas History site, here. More on the history of DFW Airport can be found in the Fort Worth Star-Telegram article “40th Anniversary: DFW Ready to Soar Into the Future” by Andrea Ahles (Jan. 11, 2014), here. DFW Wikipedia entry is here. An aerial view of the airport today, from Google Maps, is here. Photos are MUCH larger when clicked. These 2 pictures are the same,but differnt angles. HA!! Thank you! I’ve edited the text. My father worked on the airport, but I can not remember the company name he worked for, they did all the concrete work. Can you find that information. They were a world renown company.